Since I am not going to be able to see Mingaru’s next two ‘One-Man Live’ events due to schedule conflict, i wanted to catch them at some of the free lives they will surely be doing since they announced the upcoming release of their second single. 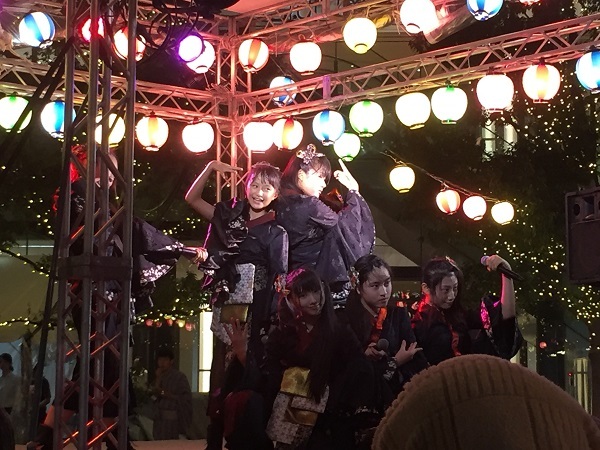 Minyo Girls, along with Wasamin and Hayabusa played at this event last year, but it was not a Summer event. It was in November. 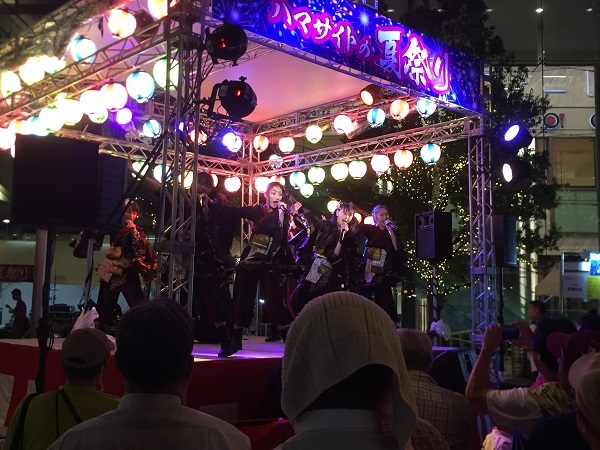 No matter, it’s a fun little festival across the street from Hamamatsucho station. My original plan was to get there a little early, have a beer at Devilcraft, go to the event, and then meet my friend for dinner afterwards. That plan got nixed when I dozed off in the mid-afternoon. I ended up having to rush out the door to hopefully not miss the event. As I approached the square the MC was still talking. Great! I didn’t miss anything. There was plenty of room in front of the stage, so I grabbed a spot on the left side. Most of the people there were merely socializing, eating, drinking, and only mildly interested in the entertainment. However, the Minyos do have a way to grab people’s attention due to their unique style, costumes, and of course their age. As they took the stage I noticed there were only seven members. Hmmm, they had posted on Twitter that eight members would be there. Who was missing? I saw Miyabi, Ramukyun…Yuua??? 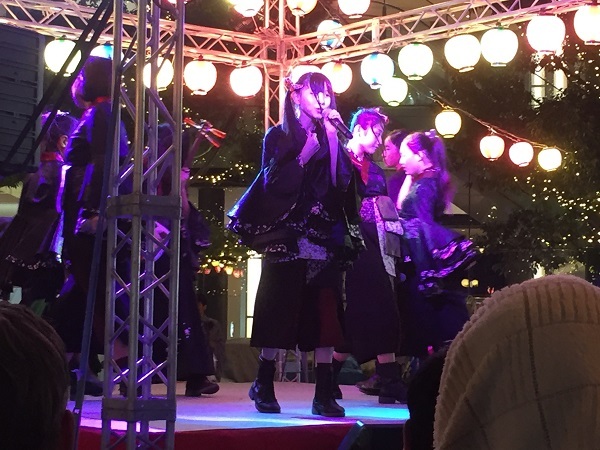 It turned out Yuua got sick in school earlier in the day, and had to miss the performance. She is posting today though, and says she feels better. While I was watching the show I noticed security seemed to be watching someone. I had one of the guards standing right in front of me with this angry scowl on his face. It didn’t take me long to figure out who they were chasing, some eccentric dude with a huge backpack to seemed to be muttering to himself and acting randomly in general. Eventually he took off toward the food area, and security seemed to follow him. I figured that would be the last time I would see him. That wasn’t the case. 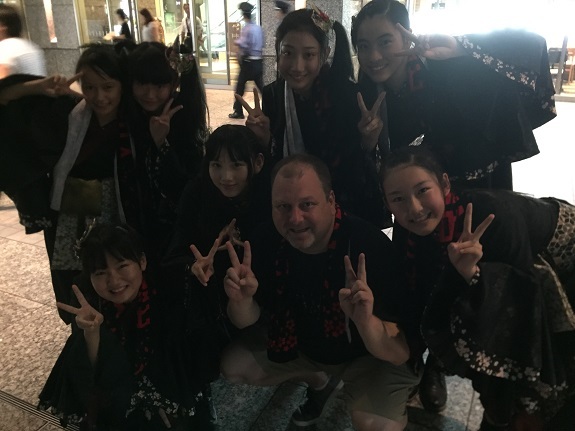 As Minyo Girls were starting their 2-shot benefits for fans, the guards chased the guy down right in front of the girls, trying to get him to leave the premises. He was screaming, ranting, and raving. The girls didn’t know what to do, so they kinda backed up. Eventually event staff came over and asked security to move the guy away from the group. However, they didn’t seem to want to touch the guy, and every time they tried to force him to move away he would spin around, and basically act like a jerk. This went on for a good five minutes, but eventually the guy disappeared. Anyway, back to the event. When the show ended I immediately went over to the booth and grabbed a pre-order form. As I was filling it out, I asked which shop was supporting this show, not realizing I knew the guy behind the table. 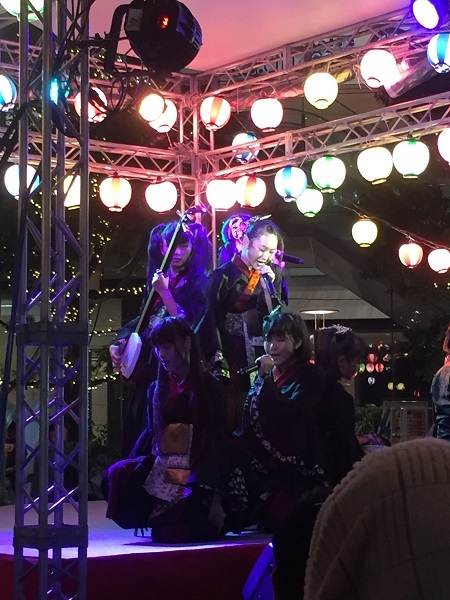 The moment he said Asakusa, I was like “Oh, it’s you!” It was the staff from Yoro-do, where Wasamin performs regularly. I pre-ordered two CDs, which was my original plan. However, I had always said that if one of my favorite members was out, I would use that event to do a 2-shot with Ramukyun. With Yuua out sick, this would have been a perfect opportunity, but I decided to stick with the original plan and just do a group 2-shot. In the meantime both Rina and Matsuri came over, said hello, and thanked me for coming. The incident with the crazy guy happened as I was stand in line, but eventually it was my turn. It was dark, and beginning to drizzle, so I hoped the photo would come out okay. As I knelt down I chanted “Mirai” and put out the peace symbols, and again Miyabi “attached” her peace symbol to me. The photo didn’t come out too badly, but a short time later they brought out some lighting to help with the photos. Maybe I should’ve asked for a re-do? Anyway, I was done. I wasn’t going to buy any more CDs, so I went and had that beer I had promised myself, and then had a late dinner at a local izakaya. I have no concerts or events to attend this weekend, so I am ending my 5-week vacation on a quiet note. Monday will be quite the day, as I am beginning my next level Japanese class, and then running off to see Wasamin in her new play.